Piri Piri seasoning can be purchased in the spice section of your supermarket or you can mix it yourself. There are several recipes on line for making your own. I used a commercial mix for this cook as a friend had given it to me. I started with a four pound chicken. I rinsed it and dried it off with a paper towel. I cut a lemon into quarters and squeezed them over a bowl, saving the juice for the marinade. I put the squeezed pieces in the chest cavity of the chicken. I added the olive oil to the lemon juice and put in 10 ml (2 teaspoons) of the piri piri seasonings. I carefully worked my fingers under the breast and thigh skin being careful not to rip the skin. I rubbed the marinade mixture under the skin. I sprinkled the surface of the chicken with the remaining 10 ml (2 teaspoons) of the piri piri seasoning. Let the bird sit in the refrigerator for an hour. I made a sauce for the potatoes by mixing the lemon juice, garlic, olive oil, water, oregano, thyme salt and pepper. I tossed the potatoes in the sauce. I put the chicken on a rack and the potatoes in a roasting pan. I put the rack with the chicken on it over the potatoes. I brushed the chicken with the marinade and put it in a 375 F oven. After twenty minutes, I brushed the chicken with marinade. Twenty five minutes later, I took the rack with the chicken on it and put it on a try. I turned the potatoes and put the chicken back over the potatoes. I brushed the chicken with marinade and put it back in the oven. Twenty minutes later, I brushed the chicken with marinade. After the chicken had been in the oven for about 1 1/2 hours, I checked to make sure the internal temperature of the breast and thighs was over 165 F. I took the chicken off the potatoes and covered in foil. I turned the potatoes and increased the temperature of the oven to 425 F to brown the potatoes. After the chicken had rested for 15 minutes, I carved it, took the potatoes out of the oven and served the meal. 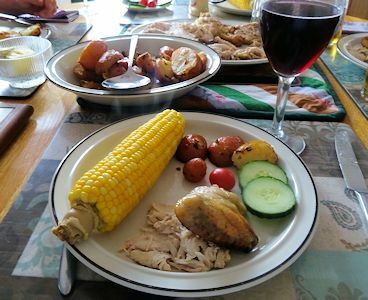 We served it with corn on the cob, fresh cucumber and tomatoes. OK, my buddy was right. This was a great meal. 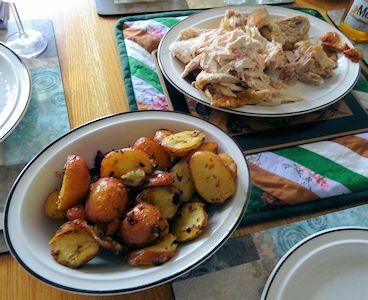 A nice fresh lemon taste to the potatoes and chicken with a bit of heat from the piri piri seasonings. Rinse the bird, inside and out. Cut a lemon in quarters. Squeeze the juice into a bowl for use in the marinade. Put the squeezed quarters in the chest cavity of the chicken. Mix 125 ml (1/2 cup) of the oil with the lemon juice and add half the piri piri seasonings. Gently work your fingers under the skin of the breast and thigh. Rub some of the olive oil/lemon marinade under the skin. Sprinkle the chicken with the rest of the piri piri seasoning. Put the chicken in the fridge, uncovered, for an hour. Make a mixture of the remaining 50 ml (1/4 cup) olive oil, the garlic, the water, the juice of the remaining 1/2 lemon, oregano, sage, salt and pepper. Toss the potatoes in the mixture. Put the potatoes and the tossing liquid in a roasting pan. Put a rack over the potatoes and brush the chicken with the oil/lemon marinade. Put the pan in a 375 F oven for 25 minutes. Brush the chicken with the oil/lemon marinade. Twenty minutes later, take the chicken and rack off the potatoes. Turn the potatoes. Put the rack back on and brush the chicken with oil/lemon marinade. Twenty minutes later, brush the chicken with the oil/lemon marinade. Twenty minutes later, make sure the internal temperature of the breast and thighs is over 165 F.
Take the chicken out of the oven and cover with foil. Turn the potatoes and increase the temperature in the oven to 425 F to brown the potatoes. After the chicken has rested for 15 minutes, carve. Serve the chicken and potatoes.